Cs3d region has well separated spin-orbit components (Δ=14.0 eV). Loss features may be observed in the Cs3d reigion at 730eV and 745eV. Commonly used in SIMS analysis, and may be observed if samples have been investigated using this technique. Cesium, also spelled caesium, is a slivery-gold metal that is liquid at or around room temperature. This element’s name is derived from the Latin caesius, meaning sky blue. Cesium reacts explosively with water. Cesium hydroxide is a very strong base that can rapidly etch the surface of glass. The most widespread use of cesium is in drilling fluids for the oil industry which mitigates the necessity of toxic suspended solids in drilling fluids. 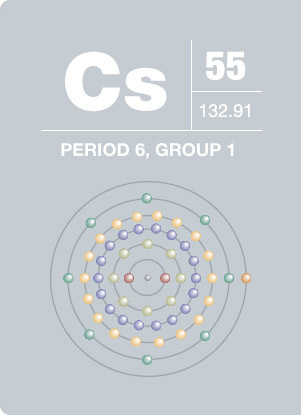 Cesium is also used in atomic clocks, in particular its isotope of atomic weight 133 (Cs-133).